Kayseria has recently launched latest Summer Lawn 2012 Chapter two Catalog for ladies. Kayseria, Exclusive Prints by Bareeze brings for Pakistani ladies premium quality fabrics. Bareeze, Minnie Minors, Leisure Club, Home Expressions, Chinyere & Kayseria are the products by Kayseria. This collection consists of latest expertise of screen printing and digital printing has been used. This stunning and glamorous collection by Kayseria lawn collection 2012 included fashionable outfits in vibrant yet beautiful colors. This collection latest fashion trend of Salwar Kameez, A-line shirts, long shirts and Bridal Frocks with Churidar Pajama fashion is high lighted. Moreover, this is an outclass collection, of coursework eye-catching and appealing. 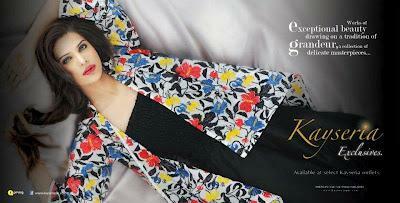 Lets have a speedy look at Kayseria Summer Chapter two Catalog for women..